File backup and complete system cloner. Is there a better alternative to MimMac? Is MimMac really the best app in Backup category? Will MimMac work good on macOS 10.13.4? MimMac clones, backups, and data synchronization made easy. MimMac is a fast, easy-to-use, and comprehensive backup and cloning utility, designed to make backing up, synchronizing, merging, and cloning your data as painless as possible. With MimMac, there's no need to set up complex scripts, or navigate a bloated interface just to do simple tasks such as running multiple simultaneous operations, or excluding items from your backup operation(s) -- everything is ready at hand in MimMac's straight-forward and compact interface. Gain control of your data. Added full support for OS X 10.6 - this is a required update, older versions of MimMac will not work properly in 10.6. Support for 10.3.9 has been dropped. A special version of MimMac 1.8.9 will be released in the future for Panther users. MimMac now automatically updates the dyld shared cache of a clone in Mac OS X 10.5 and 10.6. MimMac needs a rating. Be the first to rate this app and get the discussion started! With MimMac's myriad of options, filters, exclusions, and mirroring capabilities, you have complete control over exactly what gets backed up, and what doesn't. 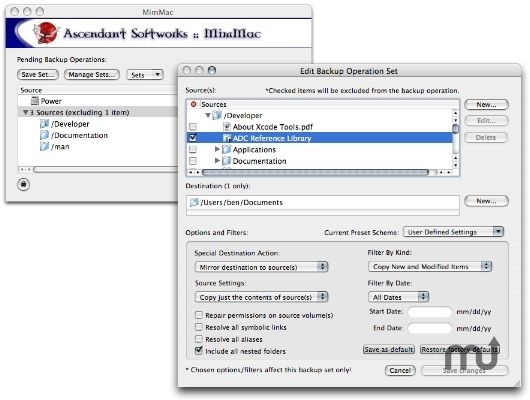 MimMac also performs incremental backups automatically, thus making your repetitive backups quick and painless. And when coupled with it's ability to check and enable ownership on destination volumes, as well as repair permissions on source volumes, you can be assured that your system clones will not only be bootable, but faithful to the original. MimMac is not a front-end for any pre-existing command line backup utilities; its backup engine was built from the ground up using Cocoa. As such, MimMac does not depend upon any third-parties in order to do its job. Fixed an issue that caused MimMac to incorrectly report that an external drive was ignoring ownership of files in Mac OS X 10.4. Many internal backup engine updates and optimizations. MimMac no longer forces serial number activation. MimMac now only blesses a clone if the source was the boot drive. 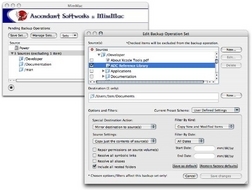 Optimized MimMac's ability to modify attributes of symbolic links in Mac OS X 10.5 and 10.6.